Norval Morrisseau. Bear Walker Society, 1992; screenprint. Courtesy of the Cantor Arts Center. Bear Walker Society: Explorations in Global Modernism, at the Cantor Arts Center, is a small exhibit focused on late Canadian painter and printmaker Norval Morrisseau. The exhibition is so small that it borders on being called something else — an exercise maybe. Of the seven works on display only one is from Morrisseau. But the size of Bear Walker Society and the dearth of Morrisseau’s work is not an impediment to getting to know the artist’s work and is designed to offer entrée into his practice. Morrisseau grew up in Northern Ontario and is the founder of the Woodlands style of painting, which draws heavily on Anishinaabe art from the Great Lakes region. Morrisseau is also a modernist whose work garnered national and international acclaim beginning in the 1960s, eventually earning him the status as one of Canada’s most prominent visual artists. The centerpiece of the bathroom-sized gallery is Morrisseau’s colorful print Bear Walker Society (1992), created late in the artist’s long career. Modest in size, Bear Walker Society features a human figure in elaborate dress, depicted with mostly solid segments of bold colors and thick black lines, both indicative of the Woodlands style. A multi-colored bear stands on the horizon behind the human figure, but the lines delineating each figure overlap in places as if they are conjoined. The print references Anishinaabe legends about people who morph into bears at night. Viewers seem to catch this transformation as it happens, with the twilight sky emerging and owl-like figures filling the sky, the figure exists as something between human and bear. 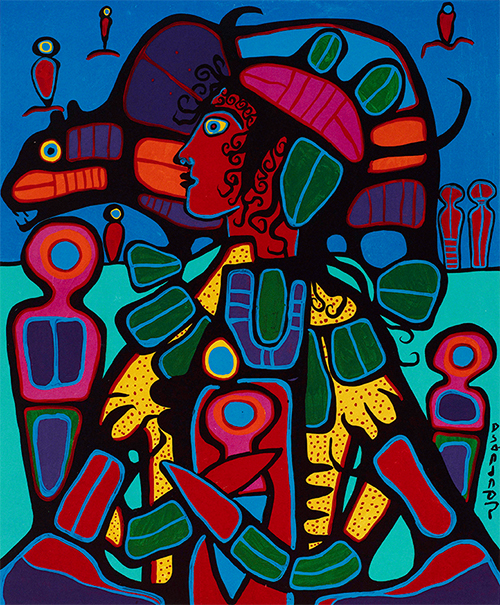 Though the simple planes of color can give Woodlands style works a sense of minimalism, Bear Walker Society, as with much of Morrisseau’s work, is quite visually intricate. Spending time with the piece, new details, objects, and patterns continually emerge. Bear Walker Society is accompanied by three pieces of Anishinaabe beadwork and three Picasso aquatint and drypoint prints. The beadwork on display includes a pair of leggings, a pair of gauntlet gloves, and a saddle decoration. They range in date from approximately 1890 to 1930, and thus their unknown creators are contemporaries of Picasso and other modernists. Each piece is adorned with a floral design that snakes around the object, but each reveals a different style, particularly the gloves. Unlike the other two pieces, the design on the gloves rests on a white background and the petals and sepals are more rounded and simple. The flowers on the leggings and saddle decoration are much more complex, both in their form and the many shades of colors used. These latter beadworks, like Morrisseau’s work, are elaborate designs created from simple units. The swirl of activity and colors in all three pieces is present in Bear Walker Society and the influence is discernible. Picasso’s prints are from a series of 31 created in 1942 to accompany a publication of George-Louis Leclerc de Buffon’s Histoire Naturelle. The black and white etchings possess a simplicity not seen in Picasso’s cubist work. Le Papillon, showing a butterfly suspended in air above a bed of flowers, is raw, even rough, and evokes energy and movement. The lines are scarcely colored-in and though the butterfly’s wings appear static one can imagine the fury of flapping that helps the insect defy gravity’s ceaseless tugging. Though created in a similar style, L’épervier is more controlled. The solemnity results from Picasso’s solid lines, stillness, and reduced noise. But the subject, a hawk, lends dignity and regality through its associations, so often seen perching on signposts, unflinching but eminently aware of its surrounding, always ready to strike. Visually, L’épervier has much in common with Bear Walker Society. The thick, clean lines are a trademark of Morrisseau’s work, especially in Bear Walker Society, where in some places they nearly become planes of black ink. The human and bear figures share the stillness of Picasso’s hawk and the owl-like figures exhibit the same aerial suspension as the butterfly, as if they are standing on the thickest of air. Some may view Morrisseau’s work as either traditional or modernist, which highlights a problem with these reductive categorizations, often aggravating for artist’s who work, or are perceived to work, outside of European traditions. Bear Walker Society neatly affirms the varied influences that played a role in the development of Morrisseau’s style. The small space and the limited number of works allows viewers to meditate on the works presented to them. In the quiet and dimly lit space, I found myself reflecting upon the works with a depth and intimacy that is sometimes lost in larger exhibitions.